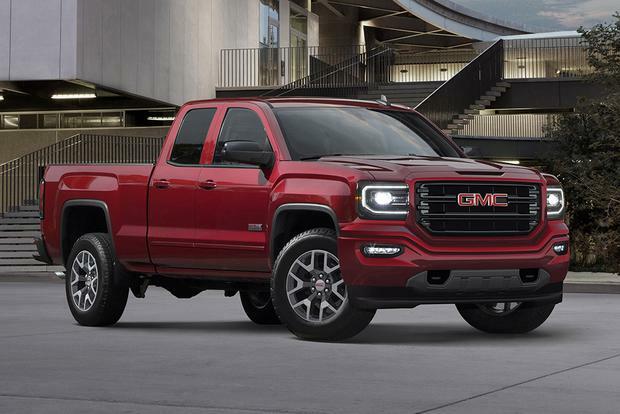 The 2018 GMC Sierra 1500 represents the final year before it gets completely redesigned, and indeed, we already know an awful lot about its successor. So is it even worth considering this Sierra if a new one is about to outshine it? Actually, we think so. Although the differences between today's range-topping Denali trim and its successor would seem to be great on account of a multitude of advanced and clever new features, the lower trims don't seem to represent a sea change. The 2018 Sierra is still a compelling and competitive truck and probably could have lasted a few more years before seeming stale. It's a dependable, well-rounded workhorse that's highly capable and packed with features. 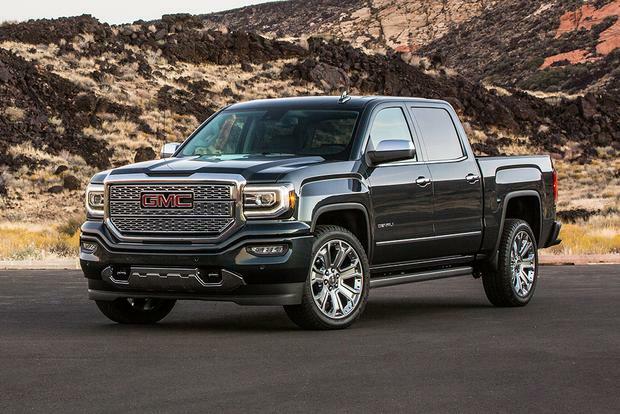 Though certainly a touch fancier than its Chevy Silverado sibling, the GMC nevertheless shares a more no-nonsense approach than rival pickups. Frankly, that should resonate with a lot of truck buyers. There's another element to consider: price. With an all-new model on the horizon, you're bound to start seeing even better deals available on the 2018 Sierra. When attached to a lower price, you may find this already desirable truck will become too good to pass up. So, although waiting for the new model certainly wouldn't be a bad idea, we also don't think you'll be kicking yourself too badly by jumping the gun and going after a great deal. There are three engines available on the 2018 GMC Sierra 1500. The base 4.3-liter V6 produces 285 horsepower and 305 lb-ft of torque. It comes standard with a 6-speed automatic transmission and can be had with rear- or 4-wheel drive (4WD). It returns 18 miles per gallon in the city, 24 mpg on the highway and 20 mpg in combined driving. 4WD effectively knocks one mpg off those estimates. Optional on the SLT and Denali is a 6.2-liter V8 that produces 420 hp and 460 lb-ft of torque. It comes standard with the 8-speed. Fuel economy is 15 mpg city/21 mpg highway/17 mpg combined with 2WD and is effectively the same with 4WD. 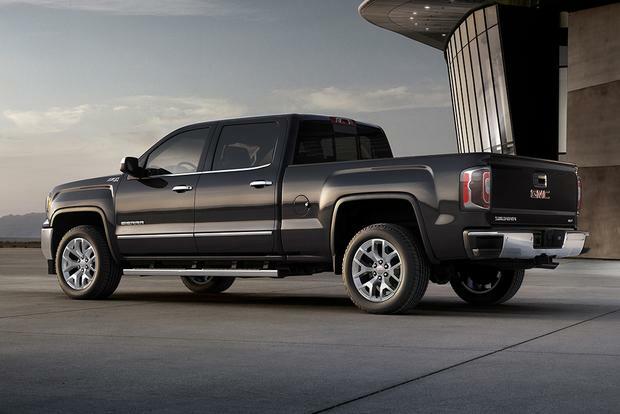 Like all full-size pickups (and its Silverado sibling), the Sierra comes with a wide array of choices ranging from bed sizes to cab preference, drivetrain, engine and trim level. We've simplified things and organized the truck's features by trim level, but choosing the right Sierra for you will likely involve more than simply picking a trim. Standard equipment on the base-level Sierra ($29,000) includes steel wheels, xenon headlights, LED running/accent lighting, power locks, cruise control, a backup camera, air conditioning, a 3-person front bench seat, a 7-in touchscreen and a 6-speaker AM/FM sound system with a USB port and an auxiliary audio jack. Some of the more basic extras found on the above trim (power windows, keyless entry) are available as options. Next up is the SLE ($35,700), which adds alloy wheels, rear privacy glass, LED bed lighting, an EZ-lift tailgate, keyless entry, power windows, a leather-wrapped steering wheel, OnStar emergency communications, onboard 4G LTE Wi-Fi, Bluetooth, HD and satellite radios, a CD player and an 8-in, upgraded touchscreen. Next up is the Sierra SLT ($42,800), which is only offered as a double cab or crew cab pickup. It adds foglights, heated power-folding mirrors, remote ignition, leather upholstery, dual-zone automatic climate control, heated power front seats, power-adjustable pedals and a tilt-telescopic steering wheel. Topping the Sierra lineup is the Denali ($52,900), which only comes in crew cab form and includes the pickup's 6.2-liter V8 engine as standard equipment. 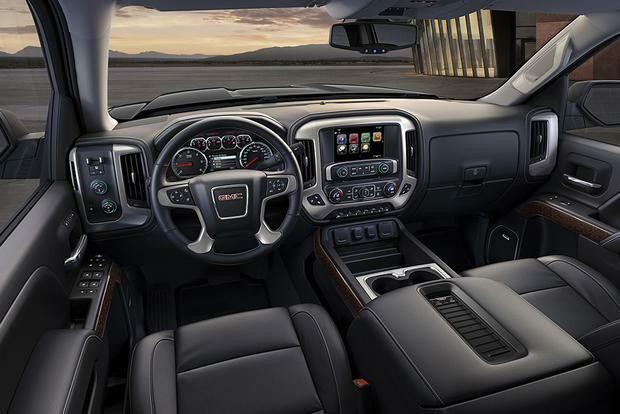 The Denali also includes special interior and exterior trim, an exclusive magnetically controlled suspension, 20-in wheels and most of the luxuries that are optional on the SLT. These include forward-collision warning and low-speed automatic braking, lane-keep assistance, automatic high beams, side assist steps, front bucket seats, a heated steering wheel, wireless smartphone charging, a navigation system, Apple CarPlay, Android Auto and a Bose sound system. The SLE and SLT can be equipped with the Elevation Edition package that adds special styling. The SLT-only All-Terrain package includes a variety of off-road-ready mechanical improvements and styling flourishes. The SLT and Denali can be equipped with a rear seat entertainment system that features a 9.2-in display and a Blu-Ray player. All GMC Sierra pickups include dual-front airbags, front-side airbags, side-curtain airbags and a backup camera. Options include a lane-departure warning system, a forward-collision alert system, lane-keep assist and automatic high beams. Also available is GM's OnStar system, which includes automatic crash notification, an emergency response button and stolen vehicle locator. In National Highway Traffic Safety Administration testing, the GMC Sierra and its twin, the Chevrolet Silverado, earned perfect 5-star ratings for overall, frontal and side crash protection. The nonprofit Insurance Institute for Highway Safety gave the Sierra extended cab the best-possible rating of Good in all crash categories but the more stringent small overlap frontal test, where it received a second-best Acceptable rating. The crew cab managed a second-worst Marginal in that same category. There's absolutely no doubt the Sierra rides and handles better than the previous-generation model. That's largely due to the new fully boxed frame, which makes the truck feel more rigid and stable. It also helps towing, as do the fully integrated trailer brakes. However, should towing really be on the agenda, we would highly recommend stepping up to a model with the 8-speed automatic that does a much better job of making sure the engine is in an appropriate gear for the current set of conditions. We were further impressed with the Sierra's interior. It may not be as interesting to look at as rival trucks -- especially when considering the Denali alongside comparably luxurious trucks -- but it's arguably the most functional. One major plus is the widely available 8-in touchscreen, which is easy to use and reach. The inclusion of Apple CarPlay and Android Auto on top trim levels adds to the technological excellence along with a multitude of USB ports. In terms of space, the Sierra is technically outdone in the back seat by most competitors, but that's relative -- this is still a huge truck. You and your passengers should be quite comfortable, and should also appreciate just how quiet this latest Sierra is when rambling down the highway. 2018 Chevrolet Silverado -- It may seem obvious, but you'll probably want to check out the Silverado if you're also interested in the Sierra. These two trucks are mechanical twins, and you might find that the Chevy offers a better deal than the GMC, or vice versa. 2018 Ford F-150 -- The Ford F-150 provides close competition to the Sierra and Silverado, boasting excellent fuel economy, high-strength towing and payload capacities and a heavily modernized interior. 2018 RAM 1500 -- The RAM 1500 offers segment-exclusive features like its stout but smooth-riding coil spring rear suspension and available diesel engine. Its Rebel model can also tackle serious terrain. There's also an all-new Ram coming for 2019. We think the SLT is the best choice given its 8-speed transmission and greater selection of desirable features. If you're going to keep your truck for a long time, you'll be happy you got as many gizmos and luxuries as possible. And sure, it costs more, but full-size trucks are so heavily discounted that its price is likely to be far more palatable than its MSRP would suggest.